Claiming that demonetisation has caused a major slowdown in the economy, the Mamata Banerjee government has allocated Rs 250 crore in its budget for alleviating the distress caused by the exercise. The money will go as one-time grants of Rs 50,000 to around 50,000 people who have come from other states to set up businesses in Bengal. Another Rs 100 crore was set aside as a special assistance fund to mitigate the suffering of the farmers affected by demonitisation. The government has already directed district magistrates to conduct surveys and find out the number of people who have lost jobs due to demonitisation. Relatedly, small businesses and start-ups affected by demonitisation will be exempt from paying VAT if their turnover is up to Rs 20 lakh. The previous exemption threshold was Rs 10 lakh. In his budget speech, Finance Minister Amit Mitra also proposed to extend the exemption on payment of primary education and rural employment cess on tea for a further period of one year until 31 March 2018. He also proposed tax exemptions for biodiesel, biomass bricket, solar water heaters, and plates and cups made of Saal leaf. In an attempt to cut the flab in the state machinery, Mitra announced the clubbing of several government departments and the merging of some 40 state undertakings. While Mitra did not propose any new taxes in the budget, Chief Minister Mamata Banerjee later claimed the government will garner additional tax revenues through better tax management and by popularising e-governance. The total planned outlay for this budget is Rs 64,733 crore and the target for tax collection is Rs 55,786.74 crore. To give a fillip to the housing industry, Mitra proposed reducing the property registration fee by 20% if it's done within a year of construction. Lashing out at the Narendra Modi regime, Mamata claimed that this year's union budget, presented on 1 February, was "insensitive, inhuman with only statistical jugglery". At the same time, though, she again appealed the central government for debt relief. Bengal's debt burden in 2016-17 was Rs 40,000 crore, and it's expected to rise to Rs 47,000 crore in 2017-18. Since panchayat polls are due in 2018 and the Lok Sabha election in 2019, the Mamata regime does not have much room to tweak budgetary allocations to rein in the piling debt. Thus, the only option is to seek help from the central government. The budget was presented in the absence of opposition CPI(M) and Congress legislators, who are boycotting the assembly in protest against the suspension of Leader of Opposition Abdul Mannan Wednesday. The protesting members instead presented a mock budget outside the assembly. 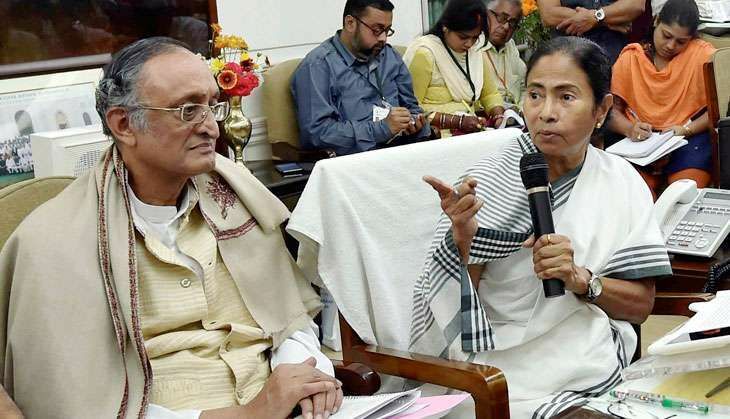 Speaking to the press, former finance minister Asim Dasgupta of the CPI(M) criticised the Mamata government's budget for failing to provide tax relief to the common people.